Volume 12 (borrowed from British Library) had at one time belonged to Robert Stephenson & Co. Ltd. Darlington: the title page being received on 8 March 1908 according to the date stamp. A key feature in many volumes were the F. Moore coloured plates. See also Locomotive Publishing Co. page. The title of this journal is a bibliographer's purgatory: it is normally different on the cover from that given on the opening page. Similar variations are found on the "official publisher's bindings"
Locomotive Magazine Souvenir No. 2 Locomotives built by the Berlin Locomotive Works. Locomotive Magazine Souvenir No. 7 Locomotives of the Great Western Railway. Locomotive Magazine Souvenir No. 9 Locomotives of the Great Central Railway. Locomotive Magazine Souvenir No. 10 Locomotives built by Henschel & Sohn, Cassel. Locomotive Magazine Souvenir No. 11 Locomotives built by Haine St. Pierre. Locomotive Magazine Souvenir No. 17 Britain's Famous Expresses. Locomotive Magazine Souvenir No. 22 Britain's Famous Expresses (No. 2). Locomotive Magazine Souvenir No. 23 Railways of Canada. Locomotive SouvenirNo. 13 constructions of Messrs. Nasmyth, Wilson & Co., Ltd.
Locomotive Souvenir No. 15: Engines built by Messrs. Hawthorn, Leslie & Co., Ltd., of Gateshead, for various railways. Locomotive Magazine Souvenir No. 26. Locomotives fitted with the Robinson Superheater. Locomotive Magazine Souvenir No. 28. Locomotives built by Messrs. Andrew Barclay, Sons & Co., Ltd., Kilmarnock. London: The Locomotive Publishing Co., Ltd. Containing thirty-two sepia collotype prints of interesting engines built by this firm, this souvenir forms a record of their varied experience in modern locomotive building. Narrow-gauge tank engines, to burn coal, oil or wood fuel are represented by examples for Chili, Persia, Egypt, India, New Zealand, Greece, Burmah, Spain and South Africa. Articulated locomotives are illustrated by engines for India and Tasmania. Two curious tank locos. with separate tenders for Cuba and Peru are included as well as two examples of standard gauge combined crane locos. British practice is represented by standard gauge engines .for the Alexandra and Newport Docks and Railway (now G.W.Ry. ), Waterford and Tramore Ry., Port of London Authority, Portsmouth Harbour, and the Llanelly and Mynydd Mawr Ry. Other engines illustrated are for the New South Wales Government Rys. and the Buenos Ayres Western Ry. and for various collieries and contractors. Fireless locomotives built for the Naval Cordite Factory and the Ministry of Munitions are also shown. Beneath each plate full dimensions and particulars are given. In a moment of absurd optimism given the lack of resources to hand which amounted to a handful of single issues; those issues indexed for specific articles in Steam Locomotive Development; and piles of notes made from inspecting bound copies in a variety of locations, such as the National Railway Musuem, the National Library of Scotland and the Coalbrookdale Museum, it was decided that this journal is too important not to be covered in depth. Furthermore, it is sufficiently important to justify some commercial or charitable organization to do a scanning operation comparable with those performed on the literature of the two major engineering organizations (Civils and Mechanicals) and the Newcomen Society. Now KPJ has access to a nearly complete run and improvements will gradually evolve. The most serious gap in the acquired set is Volume 2. This was partly filled by a visit to the IMechE Library, but its copy contains several gaps. A rather frenetic few hours were spent in the Search Engine in early November 2016 and an attempt has been made to fill these gaps, but time was limited and some of these will have to be mitigated by examining the Index. The late Issues are also poorly covered: indeed Volume 65 does not appear at all until this latest escape from the bibliographical desert of Norfolk: KPJ is still awaiting a Nelson de Rail to refute this accusation. There are many problems which require to be addressed: should such an index contain all material, or be restricted to articles relating to British steam locomotive development? [resolved to try and index almost everything] Some material duplicates material already indexed on steamindex and available on the Internet: how should this be handled? The many small paragraphs containing news are sometimes extremely interesting, but frequently duplicate much available elsewhere, notably in RCTS publications. Feedback would be extremely useful, as would assistance in indexing..
A brief visit to the NRM in York enabled the first two volumes to be inspected including Moore's Monthly Magazine published by F. Moore of 9 South Place, Finsbury in London. Perhaps, the most striking feature was the modernity of the publication: it may sound old-fashioned but it looked very modern with the use of sans serif type in shaded capitals to emblazon the title. Issues were much thinner at first, but the characteristic series articles began very early on. The modernity was stressed by the use of MMM for self-reference. 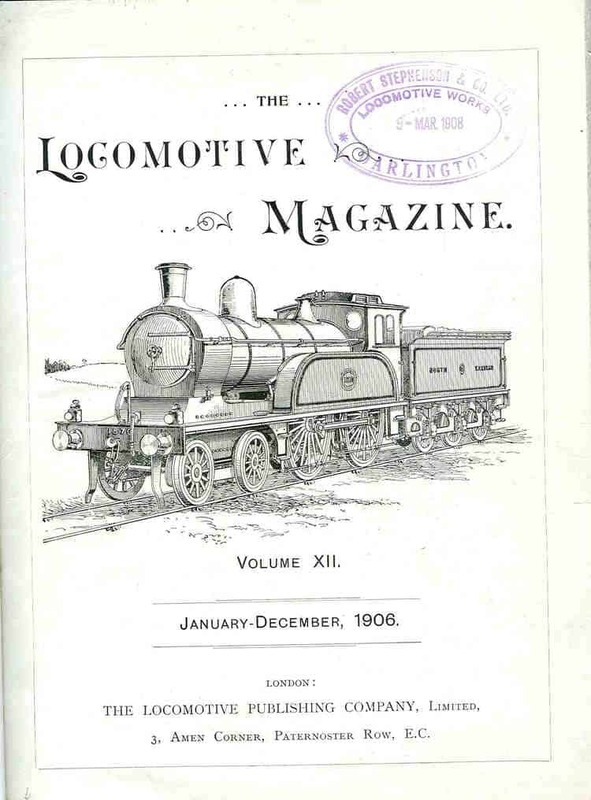 Nevertheless, Locomotive Magazine was adopted from January 1897. A substantial amount of space was devoted to listing the products of The Locomotive Publishing Company. It is interesting to look at photographs of the Webb compound Black Prince with double chimney and a Wilson Worsdell 4-4-0 and immediately be struck by their modernity. Some typographical features were absent from the early issues notable the absence of the ampersand and. the use of Rly or Rlys..
A subsequent visit (Summer 2012) to the NRM elicited the surprise that the journal produced during 1903 was published weekly and extended to two volumes (8 and 9), Otherwise it was monthly and tended to b published in the middle of the month. An extended visit in May 2013 enabled KPJ to establish that Volumes 8 and 9 did not consist of thinner issues, but contain an enormous amount of material: the reason for discontinuing weekly publishing at the end of December was not stated, but was presumably financial or logistical: a weekly must have demanded a huge amount of redaction and their standards did not appear to slip. Things got difficult in both World Wars, but editorial standards remained high and there is relatively little reference to the wars probably due to official censorship. Fifty years of publication was celebrated in a short editorial on the first page of Volume 52. A problem with some of the National treasures is that volumes which were formerly part of the Patent Office Library (which were split between St. Pancras and the Document Supply Centre) were mainly based on the low cost version printed on highly acid newsprint which are liable to degradation and sometimes have pages missing (one at St Pancras was so thin that resort had to be made to the index). There are probably more copies in secondhand booksellers (names suppliable in return for payment of at least £30) than in public libraries. These volumes are being decontaminated from asbestos! But as noted earlier Kevin enjoys access to a nearly complete set. Conventions. Much of the brief paragraph material has been scanned in an attempt to speed things up. The case of such text is changed and as far as possible transcription errors are avoided, but some caution should be observed: scanning software has a remarkable ability to introduce unseemly words. Many metric measurements were converted to imperial leading to 11/16 and similar impossible for html fractions. WN is used for all Works Numbers and RN for running numbers (the latter only where necessary). The Editor had a GBS approach to spelling and color is liable to slip through. "We have reason to believe" is always left at that. The OCR used by KPJ perverts Brunel into Brunei!